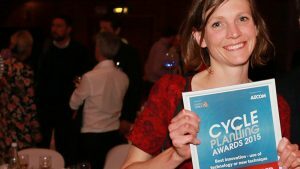 Dr Rachel Aldred, one of the speakers at the Cycle Summit, has just been named one of London’s most influential people in the Evening Standard’s Progress 1000 awards. Along with luminaries such as the Chief Executives of Network Rail and Heathrow and Gatwick airports, Dr Aldred was praised both for her academic rigour and for her understanding of the practical needs of road users. Rachel will be speaking at the Cycle Summit on the importance of infrastructure and will also be giving a demonstration of the Propensity to Cycle tool she has developed as an interactive planning support tool for providing evidence to inform investment in cycling. Places are filling up fast so please register online to be sure of your place. If you have not received an invitation and think you could benefit from attending please contact info@westsussexcycleforum.org.uk.